Last year I read Rosanna Ley's stunning novel Bay of Secrets, which not only told a beautiful story but also enlightened me on a piece of history which up until that point was unfamiliar to me; The Lost Children of Francoism (find my full review here). It was one of those novels that was already special when reading it and which I started to appreciate even more with time, as I found myself referencing it back on more than one occassion and recommending it extensively to my friends (in hindsight I would probably give it five stars rather than four!). 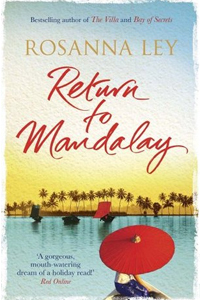 So of course I was thrilled when I discovered that Rosanna had a new novel coming out this year and one which once again would be set in a to me foreign location; Burma. This time around the history the story was seeped in was that of European settlers, the Japanese occupation during World War II and tracing back to the last dynasty ruling in the late 19th century. The story is this: Eva works for an antiquarian in Bristol. When her boss wants to send her on assignment to Burma to authenticate a new order, she's filled with excitement not only at the prospect of finally putting her education and expertise to good use, but also at the chance to breathe in the same air as her grandfather had all those years ago, when he was living in the same place just before and during the Second World War. When her grandfather, Lawrence, hears of the trip he not only tells Eva a little more about what his life was like so far away from his British home, but he also adds a request of his own. He wants his granddaughter to take a chinthe - a small replica of one of the statues that guard temples and pagodas - he has cherished for decades and return it to the person who gifted it to him in the first place. Eva is more than happy to fulfill her grandfather's request, though she doesn't realise yet quite what it is she is saying 'yes' to. What follows is an extensive journey through Burmese history as Eva and the reader follow in the footsteps of the chinthe; from her grandfather's home in Dorset, to an elderly lady (Maya) in Pyin Oo Lwin and all the way back to the Royal Palace in Mandalay. The story jumps from Lawrence's flashbacks to Maya's stories and is held together by Eva in the present, who is the one connecting all the pieces together. It's a fascinating trip, touching upon many different lives along the way. Many of these seem insignificant at the time, but they leave a lasting impression on the history of the chinthe and the people it connects along the way. As soon as I started reading I fell in love with Eva and the sheer passion she radiates for her job and antiques. She was a very likeable and sympathetic main character, even when faced with secrets from both her grandfather's past and those of the people she meets on her travels into foreign territory. Combined with her independence and fierceness in the present storyline, which runs parallel to that of the chinthe's journey, I was instantly taken by her wonderful persona. The beautifully lush descriptions of Burma and glimpses into its harrowing yet also incredibly fascinating history also were an eye-opener to me. Add to that the bittersweet story of Lawrence and Maya, and the intriguing discoveries Eva made along the way and I found this a diverse and compelling read from start to finish.